No one really knows what goes on within Weezer. The bandmates who aren’t Rivers Cuomo might not even know what’s going on. But what went on, for many torturous years, was that Cuomo broke Weezer’s very easy-to-replicate formula. Their first four albums – “Weezer,” (Blue), “Pinkerton,” “Weezer,” (Green), and “Maladroit,” were all pretty similar works, even if the former two eclipse the latter two in terms of quality. And then, for whatever reason, the band released four mediocre-to-downright-unlistenable albums, in relatively quick succession. “Make Believe,” “Weezer” (Red), “Raditude” and “Hurley” all have individual songs that are worthwhile, but none were worth the wait. “Raditude” in particular showed the band giving in to their worst desires. 2014’s “Everything Will Be Alright in the End” was a shaky, tentative return to form that left listeners with their fingers crosses, hopeful for the future. And while their new, fourth self-titled album (White) isn’t a masterpiece or even one that really demands a second play, it is reminiscent of the Weezer past. So, it’s exactly what we’ve been asking for. This has been billed as a concept album, with all ten tracks set during the summertime. I wouldn’t make the “concept album” distinction, however. Hits from their mediocre albums like “Memories” and “Beverly Hills” have been just as summer-y. Once Rivers Cuomo grew up, got that Harvard education and married that Japanese woman he questionably craved in “El Scorcho,” he couldn’t play the role of the nerdy underdog anymore. Whether something in Cuomo changed, or he was/is playing a character, Weezer’s lyrics switched from the very nerdy (“In the Garage”) to the very social (“We Are All on Drugs”). That change may have had an impact on the music, with the band only now relenting and reverting to their older, better style. Again, we can only speculate as to what goes on inside Weezer. 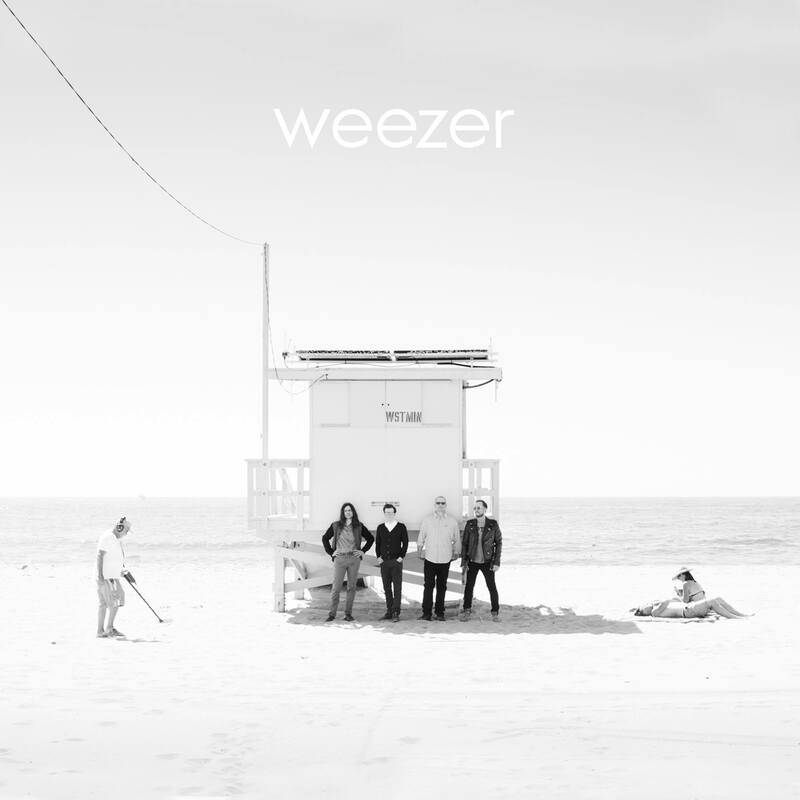 But these are summer-y songs, because that’s what Weezer does now. As we’ve learned both the easy and hard ways, Weezer operate best when they’re repurposing older material and ideas. The riff and feel of “Beverly Hills” is essentially repurposed for the great opener “California Kids.” The summer-y lyrics throughout repurpose the best parts of their worse albums, as well as any mid-range Beach Boys. Their influence is felt on this album, even amidst the guitar fuzz. And the crunchy guitar is back to stay, apparently. It’s here throughout, pleasantly buoying Cuomo’s lyrics. There’s no songs that stand out from the crowd, Weezer aimed more for a complete package. Cuomo’s lyrics might seem bland at first listen (and especially at first glance, with the aforementioned trio of “Girl” songs), but they’re packing some punches. Early single “Thank God For Girls” comes off as a little sexist until you investigate the playfulness of the verses. There’s the not-so-subtle line about a “big, fat cannoli,” and the ode to “strong” and “sweaty” women. I don’t think Cuomo is trying to rewrite “Lola” here, instead remarking on the state of gender roles and attraction. Whether it works or not is up to you (jury’s still out on my end). Elsewhere, there’s predictably weird references to Burt Bacharach, the Galapagos and Sisyphus, among others. All very heady and unexpected for a summer album. It’s easy to criticize the frustrating lack of originality on this album, because you do come off wishing it had some more zings to it. But when they tried to add those zings, we criticized them more harshly. So, take the album for what it is. It isn’t a great Weezer album, but it is a very good one, and it’s the one we deserve. From the hip “California Kids” to the surprisingly forlorn ballad “Endless Bummer,” Weezer have provided a solid set of songs that could end up going down as one of their better collections. Soak it in, dudes.